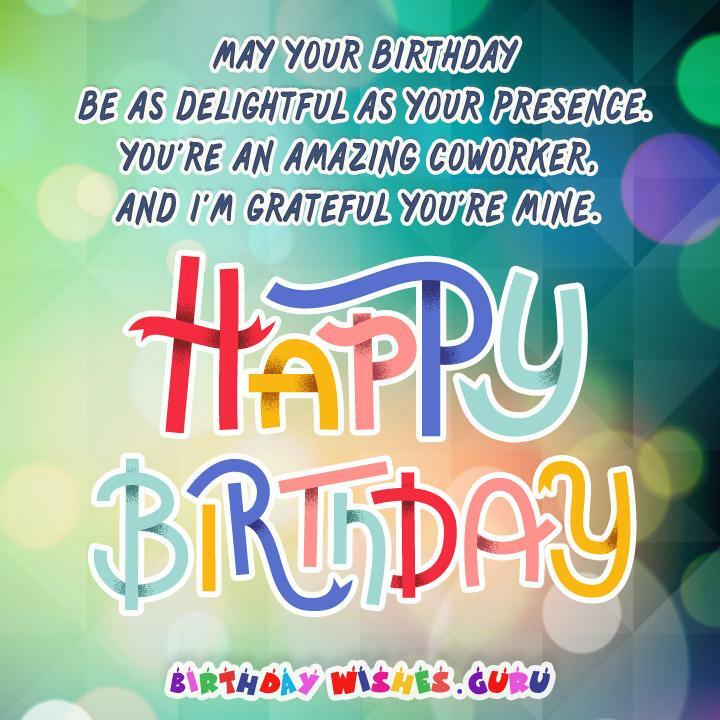 30 Unique Birthday Messages Suitable for a Coworker: It truly is a blessing when you find yourself working alongside someone you get along so well with, and it’s not uncommon for two coworkers to become close friends. When you are fortunate enough to find yourself laughing a lot at work because your coworker makes you happy or listens to your tales of woe when you’re feeling down and need a shoulder to cry on, you may find yourself wanting to do something special for this person on their birthday. Doing something out of the ordinary is a good way to show your gratitude and let this person know how important they are to you. Writing a birthday message inside an attractive or funny card is a good place to start. When you choose the right words, your coworker will appreciate how you feel, and the bond you two share will grow even stronger. Happy Birthday to the most unique and extraordinary coworker in our team! If not for you, work would just be work. Hope your birthday is as happy as you make me feel when I’m working with you. During the year following your coming birthday, may your pay raise be as awesome as you are. Working with you is a pleasure. Today you are one year older and one year closer to retiring! Happy birthday! I’m sending you birthday wishes because you’re my colleague and my friend and you always listen when I complain about the workplace. It’s hard to believe someone like you could make work enjoyable. Thanks and happy birthday to a great coworker. When I got this job, I dreaded the work. Then you came along and made it enjoyable. Hope this birthday wish brings you everything you want. If the number of birthday wishes I’m sending you now equal the number of times you made me laugh at work, lots of good luck should be coming your way. Work has united us in friendship, and I’m so grateful for the relationship we share. Happy birthday dear colleague. I enjoy the coffee breaks here because they get me away from work, and I get to talk and laugh with you. Happy birthday coworker. It’s nice to have a coworker you can tell your secrets to. Because you are like family to me, I wish you a fabulous birthday. Working with you through the years has been such a pleasure, I feel like I never want to retire. Best wishes on your birthday. Your entertaining personality fills my day at work with sunshine. Keep on shining on this special day of your birth. On your birthday, I wish you happy times like the ones you bring to me when you come to work. I’ve never known a coworker as compassionate as you. Thanks for all your support. Wishing you love, health, and happiness on your birthday. If every worker in this place was a nice to me as you are, I’d call it home. Happy birthday. I wish you a promotion, a pay raise, and a giant bonus because it’s your birthday, and I always want to work with you. Best wishes on your birthday, coworker. You always take the stress out of work and replace it with laughter. This job came with many good benefits, and one of them was you. I wish you many blessings on your birthday and always. May your birthday be as delightful as your presence. You’re an amazing coworker, and I’m grateful you’re mine. I’d work for free just to work with you, but don’t tell the boss I said that. Hope your birthday is grand. Did you ever think work could be so much fun? Neither did I until you were hired. Wishing you a splendid birthday. In case you didn’t know, everyone at work loves you. We want to wish you much birthday luck and happiness. Not only are you an outstanding worker, you’re also a divine friend. Best wishes for a terrific birthday and lots of good luck. It seems bad days at work are a thing of the past since you became my coworker and friend. May your birthday be a blessed one. Birthdays come and quickly go. A coworker like you is great to know. Hope your birthday is a great one. Happy birthday, coworker. You’re a great worker and loads of fun. I love working with you so much, I actually look forward to coming to work. Working with you is such a blast, I wish that on your birthday you have good fortune made to last and last. Today is your birthday, so I’d like to say, I hope that it’s awesome in every way. Working with you is a trip. Now that it’s your birthday, it’s the perfect time to say, I look forward to working with you each and every day. Best wishes. It’s great having a coworker who’s always on your side. You’re sincere, and so are the wishes I’m sending you on your birthday. May these wishes on your birthday bring you the kind of luck you’ve earned for being such a fabulous coworker.